Working in the technology industry is arguably the most exciting of all sectors due to its immensely rapid pace. The sector is constantly pushing for innovation and to make processes quicker, faster and more efficient. Not only is the tech industry appealing because of the inspiring developments taking place every day, but the sector also provides a good wage – with the average salary for a tech job being £62,000. Considering the average salary across the UK is £29,009, it’s safe to say that people working in tech are in a successful sector. But on top of this, it’s the CEOs and those in the top-tier roles that see the seriously impressive benefits of the industry, which comes as no surprise with some of the world’s most famous and significant companies are in the tech industry. 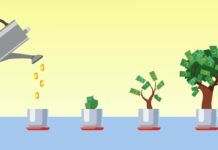 From Mark Zuckerberg’s Facebook – the globe’s largest and most influential social media platform with over 2.23 billion monthly active users – and Elon Musk, founder of Tesla and SpaceX, who is literally reaching the stars in his career, the tech industry is a sector that holds immense wealth and success. But in the industry, which tech CEOs are earning the most and how many days would it take their average employees to earn the salary of those at the top for just a single day’s work? RS Components reveal the tech giants that have the biggest pay gap between their CEO and average employee in this graphic. 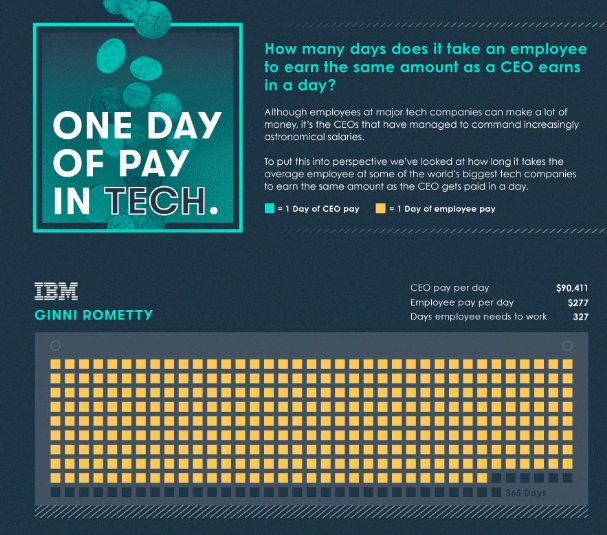 IBM comes out as the company with the biggest pay gap between its CEO and average employee. CEO Ginni Rometty has held the position since January 2012 and earns a staggering daily salary of $90,411. Joining the company back in 1981 as a systems engineer, Rometty’s wage has increased, making her one of the highest paid CEO’s in the tech industry. With IBM’s average employee pay amounting to $277, per day it would take them just under a year (327 days to be precise) to earn just what Rometty earns in one day. Apple comes in at second place for having the widest pay gap between its CEO and average employee. Tim Cook holds a daily wage of $43,014, which interestingly is not even in the top three highest CEO salaries studied, with Intel and Microsoft’s CEO’s earning at least $15,000 more each day. The average employee at Apple, however, earns the second lowest wage of all businesses analyzed, at $152 per day. The lowest earning employees are Amazon at $78 each day. At Apple, it would take employees 283 days of work to reach Cook’s daily rate. 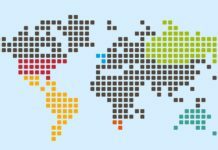 Do you still want to work for, arguably, one of the most influential and famous companies in the world? Fortunately, not all of the tech industry have such significant pay gaps between their employees, with Panasonic employees needing to work just 17 days to reach the daily salary of CEO Kazuhiro Tsuga, who earns $6,000 each day. Dell is close behind with employees needing to work 22 days to reach CEO Jo Seong-Jin’s daily salary. 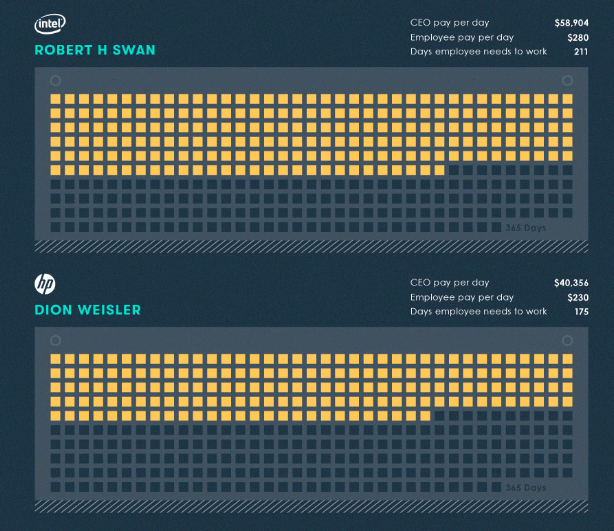 How long would it take you to earn your CEO’s daily salary? Take a look at the data and content here done by RS Components.